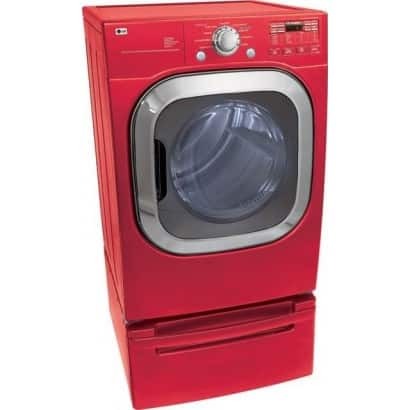 If you reach into your LG dryer model DLG2602R and discover your clothes are still soaking wet after the dry cycle has finished, your appliance is likely suffering from a lack of heat. Unfortunately, this is a common issue that is caused by a multitude of possible malfunctions. Once you’ve ruled out a problem with the high limit thermostat, the flame sensor, the thermistor, and the ignitor, you should consider examining the gas burner valve assembly. The gas burner valve assembly supplies gas to the dryer burner. A malfunctioning valve assembly won’t administer gas, which means your dryer won’t heat up. If you determine a faulty gas burner valve is causing your dryer’s no heat issue, keep reading to learn how to replace the valve assembly. Before you start repairing your dryer, unplug it from the wall and turn off the gas supply valve. You should never attempt a repair without wearing the proper safety gear, such as, work gloves and goggles. If you’re not confident in your ability to successfully replace the gas burner valve assembly, or you do not feel comfortable working with the dryer’s gas system, please contact a dryer repair specialist to complete the replacement process. Pull your dryer forward and away from your laundry room wall. On the back of your appliance, unthread the screws that secure the top panel to the dryer. Once the screws are out, pull the panel towards you, and then lift it up and off your dryer. At this point, you’ll need to disassemble the control panel. Before you disconnect any wires, we suggest taking a picture of all the wire connections, to ensure you can easily reconnect them during reassembly. After you’ve snapped a photo of the control board, start detaching the wire harnesses from the back of the board. Once all the wires are disconnected, take out the screws that hold the control board console to the dryer, and then pull the console off the front of your appliance. With the control board removed, you can disconnect the door switch, which you’ll find near the top, center of the door frame. Next, open your dryer door and unthread the screws that hold the front panel to the lint screen housing. Once the screws are out, close the door and unthread the screws at the top of the front panel. Then, carefully tilt the front panel backwards and pull it up and off your dryer. Now it’s time to take the control panel bracket off the dryer. First, locate the dryer light bulb and disconnect the wire harness running to it. Next, on the back of the bracket, you’ll find two wire retaining clips. Take out the wires being held in the retaining clips. Then, remove the screws holding the control panel bracket to the front of the dryer, and pull the bracket off your appliance. Near the bottom of your dryer, disconnect the wire harness that belongs to the moisture sensor. Once you’ve separated the wires, unthread the screws that secure the bulkhead to the dryer. Then, carefully lift the bulkhead off your appliance. Reach in-between the dryer floor and dryer drum to take the drive belt off the idler pulley and the drive motor pulley. Grab the drive belt on top of the dryer drum, and use it to help you guide the drum out of the dryer cabinet. With the drum removed, you can locate the gas burner valve assembly. Once you’ve spotted the component in the cabinet’s lower right hand corner, disconnect the wire harnesses running to the valve assembly terminals. Then, using a Phillips screwdriver, unthread the screws which secure the gas line to the burner valve. Once the screws are loose, carefully pull the gas line off the burner valve. Next, take out the screws holding the valve assembly to the mounting bracket, and then take the gas burner valve off the mounting bracket and out of the dryer cabinet. Before you can install the new valve, you’ll need to take the orifice off the old gas burner valve and place it on the new component. Once the orifice is securely attached to the new gas burner valve assembly, you can proceed with the installation process. Place the gas burner valve assembly on the mounting bracket. Make sure you line up the screw holes on the bracket with the screw holes on the valve assembly. Then, replace the screws used to secure the gas burner valve to the mounting bracket. Next, align the gas supply tube with the burner valve, and insert the tube into the valve. Once the tube and valve are connected, rethread the screws you took out earlier to secure the tube to the valve. To finish the installation, reconnect the gas burner wire harnesses to the valve terminals. Before you start putting your dryer make together, take a moment to check for any gas leaks. To do so, fill a spray bottle with soapy water, and turn the gas supply valve back on. Then, spray the gas burner valve with the soapy water. If you see any bubbles forming, a gas leak is present, meaning the connection is not tight enough. At this point, turn off the dryer’s gas supply, and try tightening the tube and valve coupling. Once you’ve adjusted the union, turn the gas back on, and run the gas leak test again. 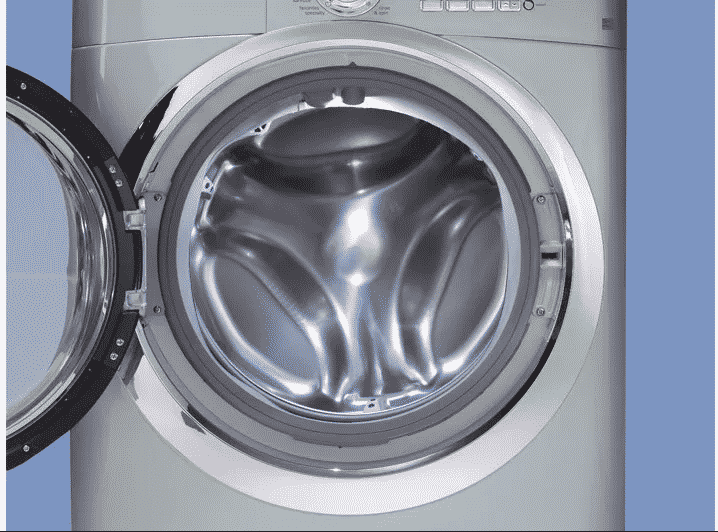 If no bubbles appear, the gas leak is no longer an issue, however, if bubbles are still forming, we suggest contacting a dryer repair technician to further inspect the problem. After you test for leaks and find none, turn the gas running to your dryer off, and start putting your appliance back together. Pick-up your dryer drum and carefully guide it into the dryer cabinet, ensuring the back of the drum sits on the drum rollers. Then, reach in-between the drum and the dryer floor to rethread the drive belt on the idler pulley and the drive motor pulley. Make sure the belt is installed in a zigzag formation. Retrieve the dryer bulkhead, and align it with the front of your dryer. Then, secure the part with the screws you took out earlier. With the bulkhead in place, reconnect the moisture sensor wire harness, and the light bulb wire harness. Now you can reattach the control board bracket. Once the bracket is in place, pull the door switch wire harness to the front of the dryer through one of the openings on the bracket, and then snap the wire into the retaining clips on the back of the bracket. Grab the dryer front panel and line it up with the front of your appliance. Before laying the panel flush, reconnect the door switch harness to the door switch, and then finish installing the front panel. Once you’ve added the screws to secure the panel, open up the dryer door, and rethread the screws that connect the front panel to the lint screen housing. Snap the control panel back on the dryer, and reattach the screws you removed earlier. Finish installing the control panel by reconnecting the wire harnesses that run to the back of the panel. To complete your repair, reinstall the dryer’s top panel, and then plug-in your appliance and turn the gas supply valve back on. If your dryer isn’t heating and you’re having trouble pinpointing the malfunction, please contact us today, and we’ll be happy to help diagnose and replace the faulty component. In your Electrolux washer model EWFLS70JSS, the tub filter, also known as a coin trap, is found inside the tub to pump hose. The filter prevents foreign objects from entering the drain pump. If the coin trap is damaged and debris is able to bypass the filter, your washer may not drain properly, or the drain pump may sustain irreparable damage, meaning it will also need to be replaced. A clogged tub filter can also cause an issue with the draining process. If you suspect a damaged tub filter, or an obstructed tub filter is behind your washer draining slowly or not draining at all, continue reading to learn how to replace the component. Before you begin disassembling your washing machine, unplug the appliance and turn off its hot and cold water supply valves. Safety should always be a priority when repairing one of your appliances, so please protect your hands and eyes by wearing work gloves and goggles as you replace the tub filter in your washer. Begin your repair by pulling your washer forward and away from your laundry room wall. Next, head to the back of your appliance and disconnect the hot and cold fill lines from the rear panel, and then detach the drain hose from the wall. Next, start unthreading the screws that hold the main top to the washing machine. Once you’ve taken out the screws, pull the top back a few inches, and then lift it up and off your washer. Underneath the main top, locate the power cord wire harness. Disconnect the harness by pushing down on the locking tab and pulling the wires apart. Then, pull the green grounding wire off the top edge of the rear mounting bracket. With a pair of needle nose pliers, push the small plastic mounting tab, holding the power cord wire, out of the washer’s metal bracket. Loosen and remove the screws securing the rear mounting bracket to the washer’s upper cabinet. Once the top and back screws are taken out, lift the bracket off the washer. Now, take out all the screws holding the main, rear panel to the washer. After all the screws are removed, locate the drain hose on the back panel, and unthread the screw securing the drain hose retainer to the panel. Then, kneel down near the bottom left corner of the back panel and remove the screws securing the washer’s control board to the panel. Finally, lift the main, rear panel up and off your machine. Take the drive belt off the back of the tub, by gently tugging on the belt while rotating the drive pulley. At this point, take a look underneath the tub and behind your washer’s control board to locate the tub to pump hose. Once you see it, reach inside the washer cabinet and place a towel under the hose to catch any water that spills out of the hose when you disconnect it from the tub. Once the towel is in place, use a pair of pliers to release the hose clamp securing the hose to the air chamber shaft. Then, pull the hose off the air chamber shaft. Next, using a screwdriver, loosen the hose clamp screw securing the hose to the tub opening. After the screw is loose, slide the clamp down, and pull the hose off the opening in the outer tub. Reach inside the hose and retrieve the tub filter sitting inside it. Don’t be surprised if the filter is filled with foreign objects and covered in unrecognizable gunk. If you want, you can shake the debris out of the filter to discover what types of objects have been taking a ride in your washing machine. After you are done inspecting your old tub filter, use a screwdriver to pry the filter cover off the damaged part. The new tub filter does not include a new cover, so you’ll need to use the old cover on your new filter. The cover is held in place by four locking tabs, simply disengage the tabs with your screwdriver, and pull the cover off the damaged tub filter. Before you put the cover on the new tub filter take it to your sink and clean it off. Now it’s time to start installing your new tub filter. First, position the washed filter cover on-top of the tub filter and push down on it to engage the locking tabs. Then, slide the tub filter into the tub to pump hose. The tab on the filter should line up with the small slot inside the hose. Once the filter is in place, reinstall the hose to the tub opening. Slide the hose clamp up the hose, and tighten its screw to secure the hose to tub connection. Next, push the hose onto the air chamber shaft and replace the clamp to secure the hose. With your new tub filter installed and ready to go, you can start reassembling your washer. First, grab the washer’s drive belt and loop it around the motor pulley. Then, as you slowly rotate the drive pulley, carefully stretch the drive belt around it. After the belt is installed, turn the drive pulley in both directions a few times to ensure the drive belt stays on and the pulley is not restricted by any obstructions. Align the rear panel with the back of your washer and secure it with the screws you removed earlier. Once you’ve finished installing the rear panel screws, reattach the screws that secure the control board to the washer’s back panel. After that, replace the drain hose retainer and rethread its screw to hold the component and drain hose in place. Line up the rear mounting bracket with the holes in the washer frame and secure it with mounting screws. Next, locate the power cord wire and the plastic retainer attached to it. Then, push the retainer back into the small opening in the reinstalled rear mounting bracket. Reattach the grounding wire to the edge of the mounting bracket, and reconnect the power cord wire harnesses. Pick up the main top panel and place it on the washer, leaving about an inch or two of space between the front of the panel and the front of the washer. Then, push the panel forward to lock it in place. Finally, reconnect the fill lines to the back of your washer and reattach the drain hose to the wall. Next, reposition your appliance against your laundry room wall, and plug-in your washing machine and turn on the hot and cold water supply valves. If replacing the tub filter in your washer did not resolve your appliance’s draining issue, please contact us today to schedule an appointment with one of our appliance repair technicians. The microwave oven was one of the 20th century’s greatest time-saving devices invented. Microwaves did not come about because someone needed to find a quicker and more convenient way to cook. Microwaves were first used in a magnetron tube invented during WW II. The British mounted the magnetron to their radar system and greatly enhanced their capability to see enemy warplanes approaching to bomb the British Isles. It was by accident that the microwave was discovered to heat food. An engineer doing research was in a room where the microwaves were bouncing off the walls. He needed a snack and dug into his pocket to eat a candy bar. The candy bar melted in his pocket and gave rise to more research that gave way to the modern microwave. Enough said about that. Now let us take a look at Vivian and find out how she uses her microwave. Vivian awakens early, wipes the sleep from her eyes, and groggily stumbles into the kitchen for her first cup of coffee. She pours a cup of yesterday’s coffee into her favorite mug and places it inside the microwave. She closes the door, pushes a few buttons that sound off the complementary beeps, and patiently waits the 60 seconds that will take to heat up a cuppa high octane jittery juice. What Vivian does not know is how that magic box is able to heat anything. Moreover, the simplicity of how a microwave works is the furthest concern until the day it stops heating her day-old Joe. After Vivian pushed the start button, she put in motion a series of events to produce a power equivalent to the energy of the expanding universe. Before heat is transferred to the inner cabin of the microwave, three switches respond in conjunction with each other to ensure the microwave does not work with the door open. These three switches are vital to the health of Vivian’s microwave and if one or more of these switches fail, the microwave will fail to heat. Bummer. If the switches are doing their job, AC voltage is sent to a diode which converts it to DC voltage, doubling it to 5,000 volts. If the diode works correctly, this new surge of voltage is sent to a magnetron, the heart of the microwave and the reason why food gets hot. If the diode begins to fail, the microwave may not be heating to its full potential and eventually will not be heating at all. It is more than likely that the magnetron will need to be replaced as well. Pro Tip: Remember that microwaves cook food from the outside toward the middle and lose momentum the further the waves travel. This is why stirring food is recommended as one of the steps towards achieving mouth-watering hot food. It’s also why something like chicken breast that is reheated in a microwave seems to dry and shrivel from the outside in. It’s also the reason Vivian is enjoying a nice hot cup of coffee before she madly rushes out the door to work. 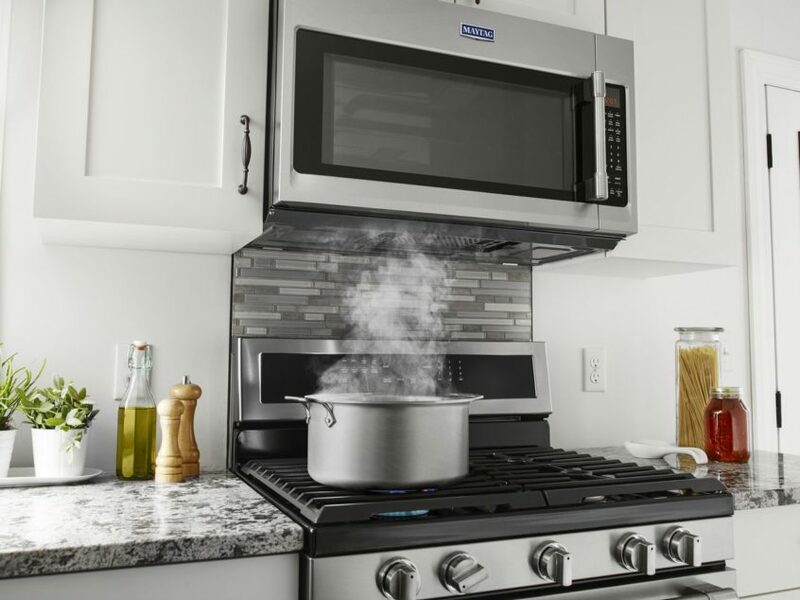 Whether you own a Whirlpool, Maytag, Kenmore, KitchenAid or Roper microwave, the following diagnostic should help you figure out why your microwave is not getting hot. And help you decide if you need to call a reputable appliance repair company. WARNING: Disconnect the microwave from any power source before moving forward. Microwaves include three switches located behind the control panel. A primary, secondary, and monitor switch all actuate to keep the microwave from cooking your kitchen while the door is open. Remove two Philips screws that hold the grill in place on top of the microwave. Remove the grill and lay aside. Locate and remove the one Philips screw that holds the control panel in place. Lift the control panel up and gently pull toward you. This will give you access to the three switches. Remove all wires from the control board. All the wires are different from each other and will only fit on the terminal they were designed for. Use needle nose pliers to remove the connectors from terminals that you can’t remove by hand. Gently squeeze the connector to release it from the terminal. The last wire you will remove is the ground wire which is connected to the microwave frame. Set the control panel aside. Remove the access cover and set it aside. Please note that the primary and secondary switches are tested with the door open. With the door open, place the multimeter leads on the connectors on the primary switch first. When closing the door the multimeter should produce a beep if the switch is good. Test the monitor switch with the door closed. When you open the door, the meter should beep. If you did not get the appropriate beep on any or all three of these switches, replace the switch. These three switches serve mainly to keep the microwave from operating with the door open. The switches also deliver voltage to the diode and magnetron which heat the microwave. If the switches test positive, this further confirms that magnetron has failed and will need to be replaced. It’s time to button up the microwave. For most folks, this is as far as you may wish to proceed. There is an ever increased chance of suffering a powerful electrical shock from the high voltage capacitor which retains a residual amount of electricity. It will need to be discharged before the magnetron and high powered diode can be accessed and replaced. Route the control panel wires back through the appropriate slots in the access cover and reattach the cover to the microwave frame. Reconnect the ground wire first and then reconnect all other wires to their compatible terminals. Push the control panel back in place and secure with its Philips screw. With the door open, replace the grill cover. Opening the door makes it easier to replace the grill. Secure with its 2-Philips screws. Do not overtighten these screws as the grill is made of plastic and you don’t want to break or crack it. Maybe you’re not a do-it-yourselfer, or maybe you simply do not have the time for appliance repairs and maintenance. Whatever the case, we are here to assist you in whatever way you appliance repair service you may need. Contact us at your convenience. We are here to serve you. 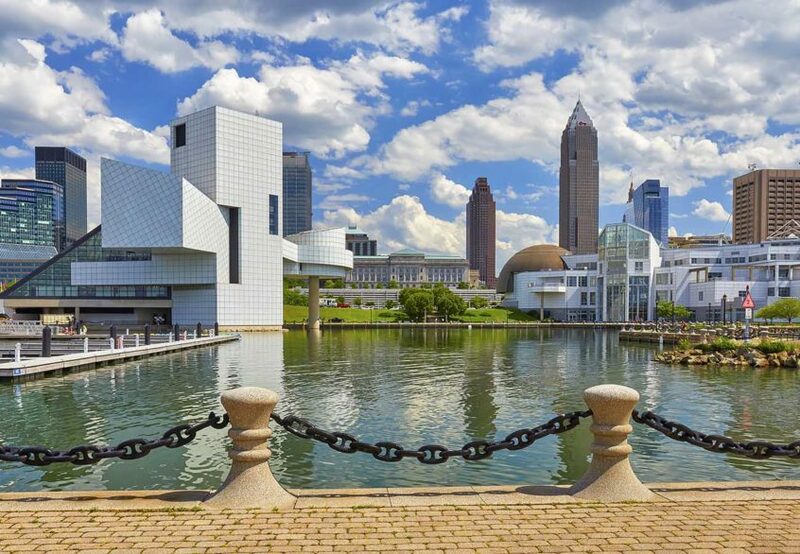 Cleveland, Ohio has steadily turned itself into a cultural mecca with world-class dining establishments, music venues, museums, art galleries, and more. If you are a resident of Cleveland or you are just stopping through, there is no excuse not to take advantage of what Cleveland has to offer. In this post, we will introduce you to a few unique ways you can spend your Saturday (or any day, for that matter) in the heart of Cleveland, Ohio. Explore The International Women’s Air And Space Museum: As you’ve likely gathered from the title, the International Women’s Air And Space Museum is dedicated to featuring some of the most influential women who have worked in aviation and space programs throughout history. When you visit the museum, you’ll have the chance to learn about the contributions these prominent women have made in the development of both of the aforementioned fields. The museum is housed in the Burke Lakefront Airport terminal building and is open every day from 8 AM to 8 PM. Admission is free and guided tours are available, lasting about 45-60 minutes in length. Have Lunch in Little Italy: Head to Little Italy on Mayfield Road to bask in the indescribably delicious aromas of sauces, pasta dishes, and Italian dessert. This section of Cleveland was first developed in the 1880’s when an Italian sculptor by the name of Joseph Carabelli began creating marble works of art on the road. In no time at all, throngs of Italian families moved in and created their own Little Italy right in the heart of Cleveland, OH. Today, you’ll find an array of cafes, delis, restaurants, and galleries all dedicated to all things Italian (and of course, Italian food). Whether you fancy a glass of prosecco or Italian wine, a rich cannoli treat, or a massive plate of spaghetti carbonora, you’ll find an endless buffet of Italian meats, cheese, and other delicacies in Cleveland’s Little Italy. In addition to incredible dining establishments, Little Italy regularly hosts various events and festivals throughout the year including live music, Bocce tournaments, and art walks. Check the calendar and make a point to attend a local event after grabbing a hearty Italian lunch! Pay Homage to Rock Legends at The Rock and Roll Hall of Fame and Museum: You don’t have to be a rock enthusiast to appreciate the contribution many legendary rock stars have made to music throughout history. The Rock and Roll Hall of Fame and Museum proudly displays many impressive, unique exhibits including Legends of Rock, The Songs That Shaped Rock and Roll, Rock Portraits by Herb Ritts, and The Pink Floyd Wall. In addition to exhibits, the museum provides educational programs, classes, and workshops for both children and adults with a vested interest in rock music and its history. Get Some Fresh Air at North Chagrin Reservation: Become one with nature at the 1,700-acre North Chagrin Reservation. This wildlife sanctuary is made up of various reserves, hiking trails, and picnic areas. If you’re interested in doing a bit of bird-watching, make your way to the Sanctuary Marsh and Sunset Pond, a prime location for spotting a host of various bird breeds. Aside from outdoor attractions, North Chagrin Reservation offers plenty of educational programs and workshops at their nature center located on site. Finally, if you aren’t all tuckered out from a day of hiking and bird-watching, get in a few rounds of golf at the Manakki Golf Course in Willoughby Hills. Spend Some Time at Town Hall: Town Hall isn’t actually the town hall of Cleveland, rather, it’s a progressive local restaurant that consistently turns out some of the most inventive dishes and cocktails in the area. Everything is organic, GMO-free, and locally-sourced and the quaint cafe even has its own bean bar where you can pick up a cup of fresh coffee. Town Hall has an outdoor patio in addition to traditional, in-door seating and is the perfect spot for breakfast, brunch, lunch, or dinner. The restaurant even features a unique late-night menu with savory and sweet dishes such as specialty milkshakes, juices, smoothies, small plates, and platters. Go on a Romantic Date at The Velvet Tango Room: The place positively screams “elegance”. The Velvet Tango Room is the perfect place to take a date, whether said date is your spouse or a prospective romantic partner. The architecture and interior design sets the tone for understated sophistication, thanks to the tin ceiling, candlelit tables, mahogany bar, and baby grand piano. The restaurant also has an outdoor terrace for dining during the warmer months. Make a point to come for the jazz which is played every night at the lounge. The bar has an impressive selection of cocktails, wines, and craft beers as well as elegant small plates to pair with your drink. Keep in mind that anyone planning to visit The Velvet Tango Room must adhere to a dress code that prohibits ball caps and t-shirts. Chow Down on Tacos at Barrio Tacos: The Velvet Tango Room is where you go for a romantic, ritzy night out and Barrio Tacos is the place to take your friends of family members for some mind-blowing tacos. Barrio Tacos allows patrons to build their own tacos with a variety of savory toppings. You can pair your tacos with a cocktail, sangria, frosty margarita or other tequila drink. Open all hours of the day, this taco joint is a great spot for brunch, lunch, or dinner. Stop by for the happy hour to get a killer deal on your festive, handcrafted cocktail, wine, or beer. Keep your eyes peeled for a Barrio Tacos food truck, which frequently makes stops at local community events and festivals. Curious about the many other things there are to see and do right in your own backyard? Keep reading our blog for more posts on various Cleveland events and activities. If you are in need of an appliance repair for any appliance in your home including your fridge, dishwasher, or dryer, get a hold of us today for a free price quote!